But the key was that people always spoke of indigenous people and issues as the past. As something that was in history, but no longer. "Maybe in the West they deal with that stuff more" we heard. It's true that the indigenous people in the eastern parts of the Canada and the U.S. have had a different history and experience than those living further west. Many of them were also forced to move west. But the stories and people are still there. It's just that they are not told or recognized broadly in the Mennonite circles with which we interacted or in the surrounding society influenced so strongly by the colonial legacy. It took some effort on our part for us to learn anything about contemporary native peoples in Virginia, but not only is there a presence, there is a strong voice used in government and policy-making. Just because the groups I am part of do not tell the stories does not mean indigenous people are not there. 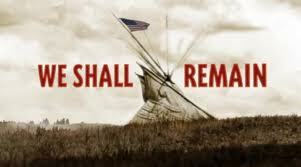 We Shall Remain points to the resilience and continuing influence of native people in the U.S. There are a few comments and appearances by contemporary native leaders and scholars, but the stories are mostly from the past. As the body of Christ, how can we model the breaking down of barriers between Jew and Gentile, slave and free, male and female, native and non-native, and start to listen through the segregation of our peoples to learn the history that's happening now?